It's something I don't understand, something I just can't explain. A super-power keeps me folding like a crane. And right before my everything is shoveled down the drain. You shelter me again and I remain without a stain. Insane, I've been that way for way too long. Cuz the pressure for success can drive a man to do wrong. A brand new being, I sing a brand new song. I feel like King Kong, Ki Ki Ki King Kong. Cuz I'm in love with something that I know I'll never have. I walk the loneliest of paths, sunny, you don't know the half. You only see me when I laugh, but I have an achilles. And it kills me to know that you will never know the real me. It lulls me to sleep and I don't ever wanna wake up. Not another day where I'm cakin' on this make-up. I just wanna be be blessed. I just wanna bleed less. Don't wanna live my life with all these regrets, she says. Cuz underneath of every single smile that I crack. There's an emptiness I have and it's always breakin' my back. The heaviness of nothingness, I don't see the fun in this. 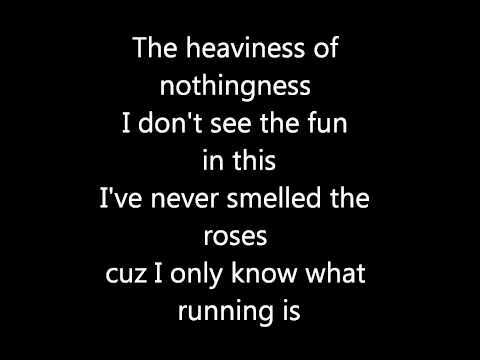 I've never smelled the roses cuz I only know what running is. I wanna know who's running this, it's time to shut the show down. Balls against the wall is the only way I know how. See how, they leave me here to die until I bleed out. Til I muster up the mother fu**ing energy to scream out. Stop now. Please don't. Please help. Dear self. This is me talkin' to me, as I near hell. The fire burns, sure as heck. 1 2 Life check. Livin' like this always makes me like life less. Tip top of the Eiffel with a rifle, it's stiflin hot. With my finger on the trigger that I might pull. Might not, who knows? Blow open a new hole. Unpredictable and crazy that's my tag-team duo. Cuz one day I'll explode and retire from this long life. Not another night of walkin' streets until the sky's bright. Not another day where I'm chasin' after the lime light. Not another day where I'm afraid I'm gonna blow up. And go nuts, walk into the bank this is a hold up. And the sherrif has to come and tell my mother, mam your son died. No I can't let it happen like that. God already showed me that isn't how the story goes. God already told me that I'd be a king one day. And that's the only reason I try and avoid the gun-play. The only reason I don't drive the wrong way down a one-way.